Choose from 30 newly renovated 3.5-star quality rooms catering for families, tour groups and business travellers. Our rooms mix country charm with a fresh modern look. 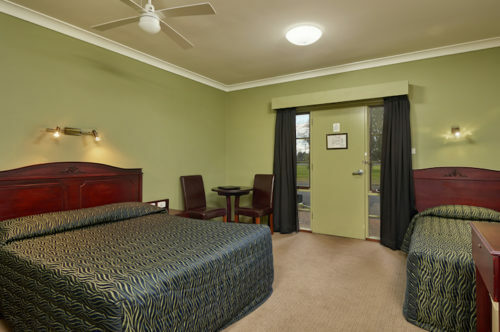 Air-conditioned, non-smoking rooms are equipped with everything you’ll need to enjoy your stay. FREE breakfast, FREE Wi-Fi, LCD TV’s (some rooms feature 55” – 65” smart TV’s), tea and coffee and iron. Relax in our pool and BBQ area and enjoy a meal in our restaurant and bar. Enjoy free breakfast and Wi-Fi in a newly refurbished room. Park right outside your room with an outlook over country gardens. Family rooms have a Queen and 1 Single bed to accommodate 3. 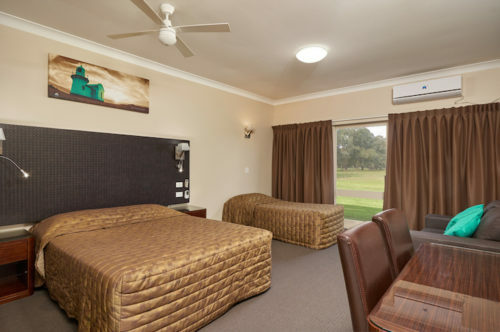 All rooms have LCD TV, microwave, tea and coffee facilities, iron and ironing board. Enjoy free breakfast and Wi-Fi in a newly refurbished room. Park right outside your room with an outlook over country gardens. All rooms have a Queen and a Single bed to accommodate a maximum of 3. Some interconnecting rooms available. A large spacious room and living area. 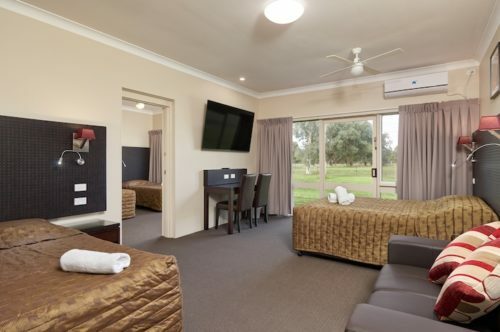 All rooms have a 55” LCD HD Smart TV, microwave, tea and coffee facilities, iron and ironing board. Enjoy free breakfast and Wi-Fi in a newly refurbished room. Park right outside your room with an outlook over country gardens. The Deluxe Suites have a Queen in the main room and 2 Single beds in a separate room to accommodate 4. 65” LCD HD Smart TV is in main room and another 32” LCD TV in the bedroom. This room has a very large bathroom featuring a spa bath. 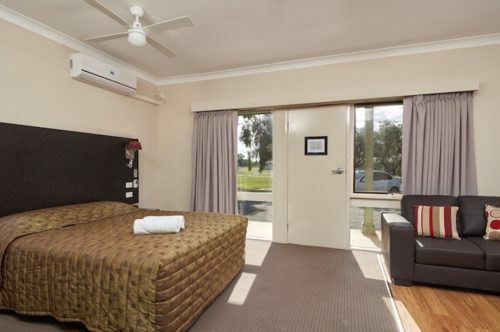 All rooms have a microwave, tea and coffee facilities, iron and ironing board. A large spacious room and living area with space for kids to play. Doors open onto the gardens perfect for playing or to enjoy the view.